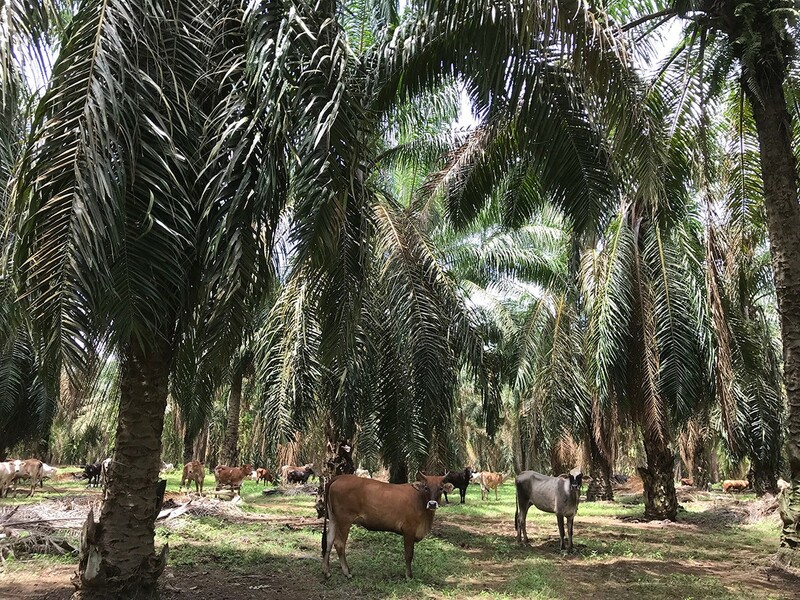 Cattle in Oil Palm Plantation, Why Not? The increasingly limited land along with population growth has been frequently discussed in relation to the development of land-based investments, such as agriculture and livestock. Various efforts are taken to anticipate this matter to realize food self-sufficiency, from paddy-fish integrated farming, crops integrated cultivation, up to utilizing plantations for livestock farming. The effort is being taken by PT Superindo Utama Jaya (SUJ), a subsidiary of PT Sinar Jaya Agro Investama. The Company has been granted 201 heads of Brahman Cross cattle in total, consists of 196 heifers and 10 bulls by the Australian Government through Indonesia Australia Commercial Cattle Breeding (IACCB) Program. PT SUJ has been running an-intensive cattle breeding (breedlot) and owns cattle yards with carrying capacity for more than 2,000 heads of cattle, which uses local PO cattle (Ongole Breed). In 2016, the company was selected to receive grant from the IACCB program. In the same year, the parent company bought an oil palm plantation company, PT Nakau, which owned 2,602 hectares land in Kotabumi, North Lampung. The company then decided to move all the cattle, both the company's local cattle and IACCB’s cattle, from the breedlot to oil palm plantation. Currently 613 calves and cows are raised, utilizing 1,400 ha land owned by PT Nakau. Each cattle requires 30 hectare of land per head per day. The cattle are grazed in the plantation, within a certain area size based on grass availability. Every day, cattle are rotated to other parts of the plantation. This will continue for 90 days. After 90 days, cattle are brought to cattle yard for health check, weighing, and pregnancy test. The early pregnant cows will be released after 2 days in the cattle yard. Meanwhile, cows that are in 7 month (or more) pregnancy will be kept in pens for calving. 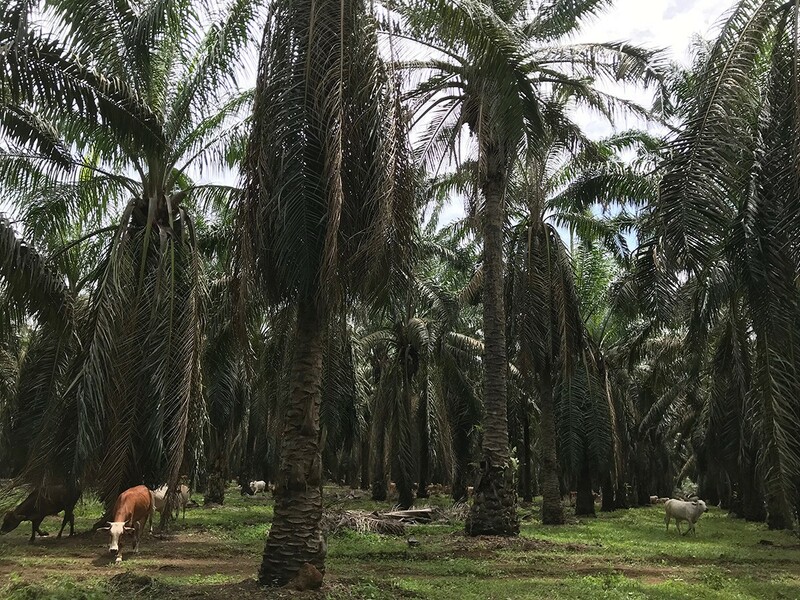 In addition to overcoming land limitation issue, the mutualism symbiosis between cattle and oil palm plantations is able to create efficiency in the company's operational costs, which include maintenance and feed costs. Feri, SUJ Cattle Yard Manager, said that before joining IACCB program, the company spent an average Rp14,000 per head per day for feed and personnel costs. Now, the costs were reduced to Rp8,000 per head per day with the help of feed formulation using oil palm by-products such as kernel cakes and solid or palm sludge with a mixture composition up to 30% of the total feed requirement. “For now, we are using 30% of solid because it has just started. Now [operational cost for cattle yard] is still Rp 8,000. Later, when it (the ratio of concentrate solid composition, the expected operational cost) is able to reach 50:50, the cattle yard operational cost can be reduced to Rp5,000 per head per day," Feri said. Sihono, Chief Stockmen at PT Nakau who is in charge of around 613 heads of cattle, supported by 3 stockmen, explained that reduction of feed and further maintenance costs will happen after the commodity has been moved. Ihsanul Abrar, Head of Administration at PT SUJ's Plantation who is in charge of the plantation said that grazing cattle in oil palm areas has potentially saved around Rp200 million - Rp300 million per year, which was usually allocated for lawn mowers and herbicides, given that land for cattle grazing may reach 1,400 ha. “Grass in the plantation areas must be handled. We don’t have to do that anymore. It’s now the cattle’s job. Doing it manually will cost Rp 84,000 per hectare for wages. Using chemical [herbicide for grass that cannot be cut] will cost around Rp43,000 per hectare including wages. That makes Rp120,000 per hectare," he explained. Meanwhile, another potential benefit is the natural fertilizer for grass resulting from cattle manures. One of the IACCB program partners in Central Kalimantan, PT Kalteng Andinipalma Lestari (KAL), which has been practicing cattle breeding in oil palm plantation since 3 years ago, stated that it had benefited from grazing cattle in their plantation, in form of increased production of palm fresh fruit bunches (FFB), from previously around 18 tons of FFB per hectare to 20 tons per ha. With regard to the impacts of grazing cattle in oil palm plantation areas, IACCB is currently working with Indonesia’s Technology Application Research Agency (BPPT) and the Indonesian Science Institute (LIPI), to evaluate some aspects such as land compaction that might reduce soil fertility and the potential spread of genoderma fungi that may have damaging impacts on the oil palm plants. “It’s been more than 3 years and no disease case has occurred, but we have to watch the palm condition. We should not graze cattle in young plantation particularly those are under 4 years old, since the cattle might eat all the leaves," said IACCB Program Manager, Robi Agustiar. According to him, a trial can only be carried out under a plantation, which trees are already 4 years old or more. A trial has been conducted in PT SUJ area where plants are over 8 years old, with several groups of cattle being grazed, such as pregnant heifers and ready-to-join heifers, as well as calves aged more than 4 months to 8 months old. IACCB Program Director, Richard Slaney, said the cooperation program was a step in strengthening the relationship between Indonesia and Australia. Indonesia is one of Australia's neighbouring countries, which is also one of the biggest breeder cattle importers of the Kangaroo Country. However, the importation was disrupted due to animal welfare issues. This program is not only about sending cattle for commercial breeding, but also to guide farmers or program’s partners about animal welfare. One distinguished aspect is the absence of cattle tethering. All cattle, both in pens and under plantation areas, are left free to move around in the fenced area. For the cattle under palm plantation, farmers use low-voltage electric fence that gives a harmless shock effect to the cattle. Over time, cattle are accustomed to stay inside the fenced area. This method allows cattle to move freely, enabling them to immediately find partners during the joining period. Feed and water intake is also crucial. Cattle that were usually fed and drink at a certain time can now eat and drink at any time, with balanced nutrition. To support the nutritional needs, PT Nakau also planted four types of high protein grasses as feed mixtures. Besides feeding, weaning time is also crucial to boost cattle reproduction. Calves between 3 to 4 months old are immediately weaned. This way, the cow can immediately back to pregnancy. Slaney emphasized that raising cattle requires precision and well management to ensure cattle welfare, feed sufficiency, and to ensure that their reproduction process is not hindered. This, in addition to ensure cattle welfare, will increase economic value for farmers. In addition to the integrated cattle-oil palm model, the IACCB also implements two other models. One of them is the semi-intensive grazing as practiced in Australia, where cattle are grazed in a developed pasture during the day and returned to the yards in the evening. The other model is cut-and-carry, where cattle are jointly raised by farmer groups in pens. The program is implemented, among others, in South Lampung by Koperasi Produksi Ternak Maju Sejahtera (KPT MS), a farmer group cooperative. The Cooperative has 38 community groups in total, who are entrusted to breed 100 heads of heifers since April 2017. Two cattle were culled (slaughtered) due to health reason. Up to this point, the cooperative has produced 142 calves, 87 of which have been weaned. A few days ago, the cooperative was able to sell 87 calves produced from the first calving cycle, 34 of which was sold out on the first day of the auction with a total selling price of Rp409.50 million. “It is the second gestation cycle, 50 calves have been born from 100% pregnancy [98 heads],” said Supardi, who is involved in the program.